Tuesday has kicked my tail. Totally kicked it. I'm glad the day is done and that I cooked my kids' meal yesterday. Friday also kicked me pretty hard, so we ate out. Normally, I don't like to eat out. I like knowing where my food comes from and how it is prepared. And six nights out of seven, I really enjoy cooking. When we do go out, it's usually ethnic (Thai, Mexican, Japanese) and Gary and I try to deconstruct our dishes to figure out how to adapt them to home cooking. We went to a dive-y Chinese place that also has a fabulous Thai menu. Thinking about how much we enjoyed our meal, and knowing that we had the essential ingredients, I looked up a recipe for Pad Thai in Joy of Cooking. And promptly closed the book because the recipe was too too long and complicated. Here's what I did instead. 1" fresh ginger, cut in match sticks. Remove from fire and aside when tender crisp. Cube about half a block firm tofu and pat dry. Marinate briefly in the sauce you just made, then pan-fry in the same gingery-garlicy oil. Boil enough soba (buckwheat) noodles or whole wheat spaghetti noodles for your family. I didn't have enough of either so I combined them and no one noticed. When they were almost finished, I tossed in a cup of shrimp. Drain, mix with vegetables and tofu. Top with the sauce you made and gently toss to combine. Serve it up: we added some frozen crumbles of thai basil that my mom bought and didn't like- I froze the entire bunch, crushed it, and dole out a bit as needed. Regular basil would work, too. I topped the adult noodle bowls with a bit of Sriracha, Thai chili-garlic sauce. We like the kid with the rooster on the label and the green lid. Everyone ate it up. I was really happy that I left the ginger in because it added a lot to the dish. There was only a tiny bit left. I ate that cold for lunch and enjoyed the ginger even more. So, this is typically how I cook: "Oh, Lord. It's 4:30. What needs to be used?" Butternut squash, carrots, a cup of coconut milk from a coconut little boy opened with his grandparents this weekend. A knob of ginger I bought for another recipe. A brick of cream cheese that needed to be finished off. A mistakenly-bought container of hot-pepper labne (thick and creamy Middle-eastern yogurt cheese). Knowing we're about to go on a mini-vacation for a bit and some food just won't keep. 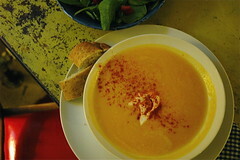 Cool and grey day, feeling a little poorly, wanting warming soup. Steam squash and carrots over water until tender. Cook onion, garlic, and grated ginger in a bit of olive oil. Combine all in the water you used to steam the veggies. Puree with an immersion blender (or a regular blender, but my immersion blender gets more use than any other small kitchen appliance we own). Add lime juice and cream cheese*, puree again. Salt to taste. When ready to serve, top with a scoop of labne/yogurt/whatever you're using. The hot pepper labne gave this a real kick. I didn't use it with little boy's serving, though, because mine was crazy hot. Sprinkle with paprika. We ate ours with a spinach and bell pepper salad and some garlic herb bread I picked up that afternoon. It was definitely a hit- perfect for a chilly night. I'm eating the very last cup-full for lunch. And planning to make it again the next cold rainy night we have. *If you're concerned about fat content, you could cook a potato or add some silken tofu and puree it to sub for the cream cheese. You'll keep most of the velvety texture that way. 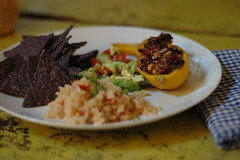 A few weeks ago I stumbled on a blog post about cooking for kids. I've been very fortunate that my child has a fairly adventurous palate- because Gary and I certainly do. When I was pregnant with him, I kept eating all of the usual strange and spicy foods I was accustomed to, kept it up when I was nursing, then started introducing them to him when he was ready for solids. A very spicy thai curry risotto was one of his first foods. This particular dish was so spicy that it made my scalp tingle, but he kept asking for more! Now that my increasingly not-little-boy is in school and surrounded by kids who subsist on a diet of cheese puffs, deli meats, and "froot" products, he's become a little more picky, a little less likely to eat what we want to eat, more aware of what the kids at school want. I think I've told you about his allergy to certain ingredients that find their way into conventional dairy product. I'm pretty strict about organic-only dairy at home or at school, but if we're out and everyone is having pizza, we pull the cheese off of the pizza. But pizza and chicken nuggets don't make me happy, so I was thrilled to find out about the online cooking group at Raising Foodies. Jocelyn is like the rest of us- working, busy, hungry. And, like me, committed to good food for the family table. She's organized an 8 week cooking group where the participants make a new dish each week and share the recipe with their child's reaction to it. This Roasted Tomato and Eggplant Soup is my first "new" reicpe. This weekend I was startled to find ten eggplant in my CSA share. Eight skinny white ones, one medium-sized traditional globe eggplant. Add that to two small striped globe eggplant still in my fridge from the week before. I consulted with some foodie friends and made this delicious honey-salted fried eggplant with two of the skinnies when a friend was over on Sunday. * I also found this recipe for tomato and eggplant soup. We like Indian-spiced food, and this had plenty of curry, so I gave it a try. The instructions looked a bit labor intensive, but it was largely untended. I'll make it again, because it was a hit! And BOTH Gary and Nash are eggplant-deniers. Mix tomatoes, carrots, garlic, and olive oil, s/p on a large roasting pan, with tomatoes skin-side up. Mix the second set of vegetables on the second roasting pan. Roast for 45 min, shaking occasionally, making sure that the tomato tray is on top. Let cool slightly, peel tomatoes. Puree the tomato mixture and half of the eggplant mixture (in a blender, food processor, or with an immersion blender. Thin with 3-4 cups of water or veg broth (I used water). Salt to taste and reheat. To serve: bed couscous in a soup bowl, ladle soup over the couscous and top with the reserved eggplant and chickpea mixture. Sprinkle with cilantro. 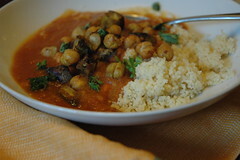 The roasted chickpea and eggplant mixture was so good I could have (and did) eat it by itself. I pureed most of the eggplant to ensure that my boys would eat it. They each got 3-4 cubes on top of their soup. I'll have this again for lunch today. I may make more and see how it freezes. This was a pretty light meal with a hearty flavor- it felt very substantial. *It was so, so good, but just a little advice- if you're unaccustomed to fried food, don't eat 15 slices (there were 60 or so super thin potato-chip sized slices) unless you want to spend time with sir alka-seltzer later.